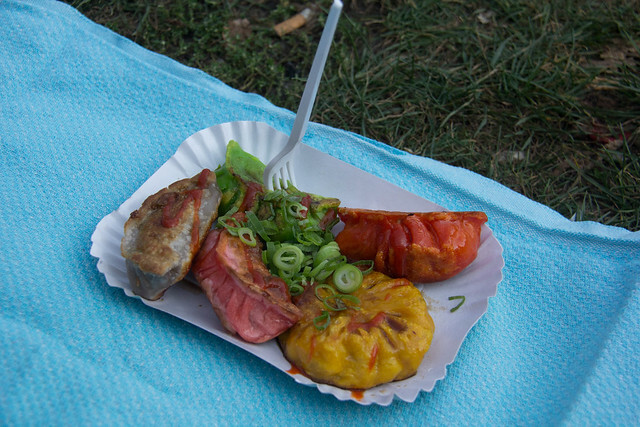 Saturday I hung out with one of my colleagues, hitting up Preußenpark and it’s weekend Thai food market. I’m not sure about the exact history of the market, but the long and short of it is that on warm spring/summer/fall weekends, it’s possible to get home cooked, authentic, Thai food in the park for a song. The dish below cost a mere 5€; a bargain. Five dumplings: vegetarian, beef, pork, chicken, and (I believe) lamb. In my experience, there are usually somewhere between 30-50 stands set up with a myriad of delicious options. The key is to bring a picnic blanket – when we were there yesterday, around 1pm, there were plenty of places to sit, but I’ve also seen it so crowded that finding a bit of open space is nearly impossible (as is finding your friends in the crowd). 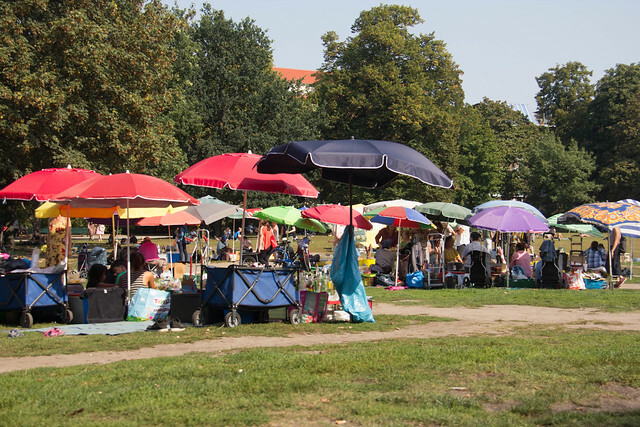 Some of the booths at Prueßenpark — there were a lot more than just these. 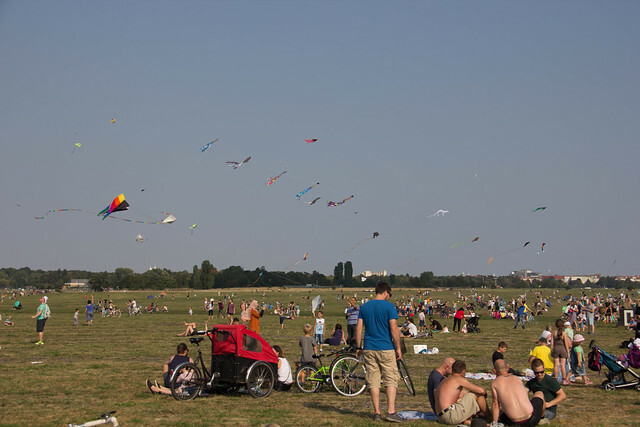 After that we headed over to Tempelhofer Feld, where we had two options for fun: watching firefighters compete to be Germany’s best firefighter or watching the kite festival. Firefighters pulling the hose up to the top of the structure. 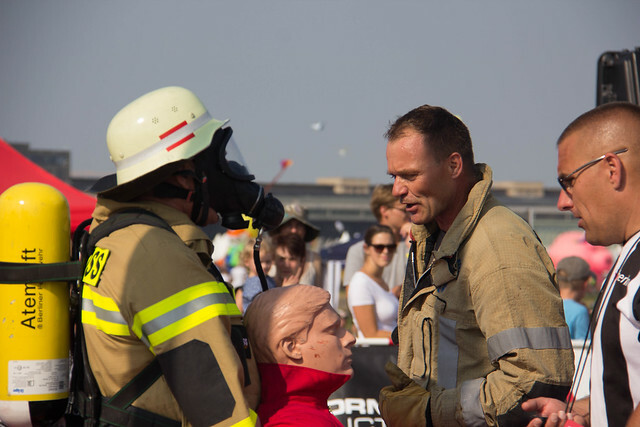 Both were excellent fun – and I have to say that the firefighter’s competition looked incredibly intense. 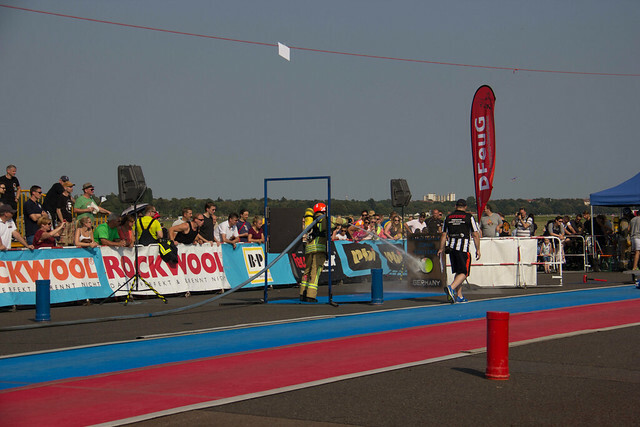 The men were wearing their full uniforms, complete with helmets, jackets, oxygen tanks – and the race consisted of carrying a bundled fire hose up a stairwell (roughly the third floor), then hauling up another fire hose using a rope, then running down the stairs, using a hammer to knock something (I couldn’t tell exactly what) down a track, then they had to run a slalom down to grab a live fire hose, that they then dragged down the course to a “door”, through the door, use the water to hit a target, then grab a mannequin that weighted 80kg, which they had to drag 30 meters to the finish line. After dragging the hose down the course, they went through the metal door, turned on the water and aimed for the target. 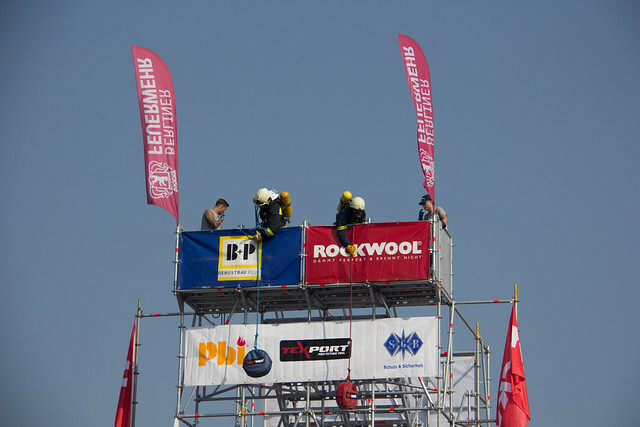 One of the contestants was 60 years old; here he is dragging his man down the course, getting encouragement from his competitor. Some of them did it in less than two minutes. 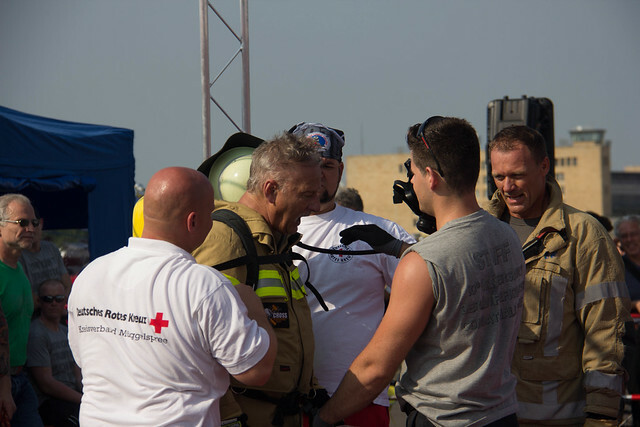 The 60 year old after completing the challenge — gets attention from the support team and the Red Cross.